What Is It About a Cowboy? I enjoy reading and writing heroes who start the book as the least likely man to end up in a happy ever after. Cowboys make perfect hero material—especially if he’s also a country singer, small-town sheriff or an ex-soldier. The reasons are many. Whether he’s a chart-topping singer, a rodeo cowboy or a gentleman rancher, I want my romance cowboy be the epitome of the hard working man. Who doesn’t like to watch or imagine a man working? Despite the heroine’s independence and career, there’s something fundamental about being taken care of or at least knowing she can be if she decided to take a chance with life and give up what she’s been doing up until now. Cowboys should be tough enough to withstand long hot days and cold nights out on the range rounding up cattle, yet be as caring and gentle as a mother with a babe when it comes to their animals—especially when it comes to his dog and horse. To me, these qualities, no matter how big of a jerk he might be in the beginning of the book, show he’s got a sensitive spot under all the gruff, and he’ll protect those he loves, which includes the heroine—once she borrows under his hard exterior and lands in his big, soft heart. What’s a good western without a saloon scene or two? My cowboys are as much at home singing in some honky-tonk as they are drinking or fighting in one. Since they are such loners, but don’t take crap from anyone, cowboys are often trouble magnets. What better reason to get into trouble than for the heroine—whether she wants him to protect her or not? If he’s also famous, besides being a cowboy, he’s even more likely to find himself in trouble with the heroine, as he’s also magnet for other woman. Not that he’d step out of line once he has his heart set on the heroine, though the constant attention is bound to cause some friction. But who could stay made at her cowboy once he sings a love song he’d written just for her? Even after the heroine captures the big, bad cowboy’s heart, she might have a hard time holding him. 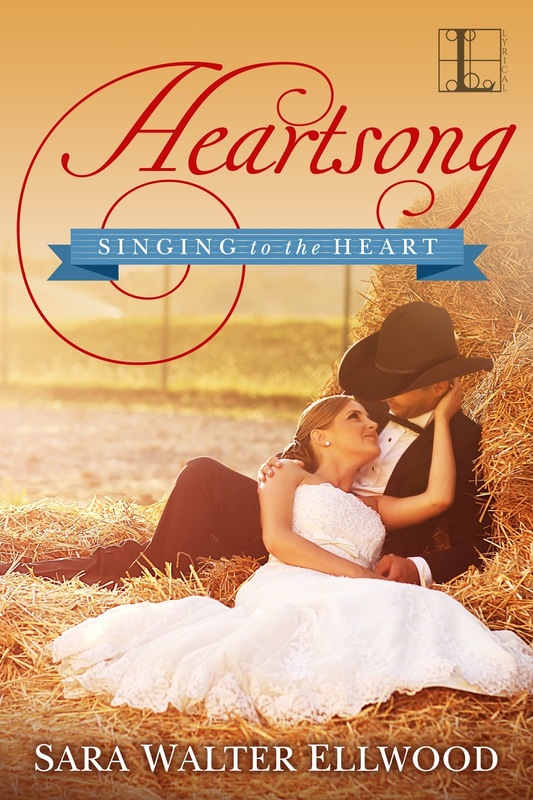 He’ll buck his feelings as much as a bronco will a rodeo cowboy, but in the end, his sense of honor and loyalty will kick in and he’ll tame that bronc to find himself in a happily ever after and singing into the sunset with his woman by his side. 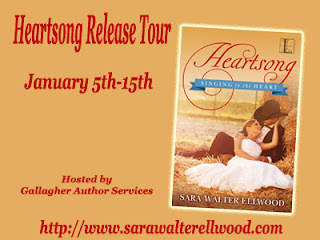 Sara’s giving away an ecopy of HEARTSONG. Enter via the rafflecopter. Sara Walter Ellwood has long ago left the farm for the glamour of the big town, she draws on her experiences growing up on a small hobby farm in West Central Pennsylvania to write her contemporary westerns. She’s been married to her college sweetheart for over 20 years, and they have two teenagers and one very spoiled rescue cat named Penny. She longs to visit the places she writes about and jokes she’s a cowgirl at heart stuck in Pennsylvania suburbia. 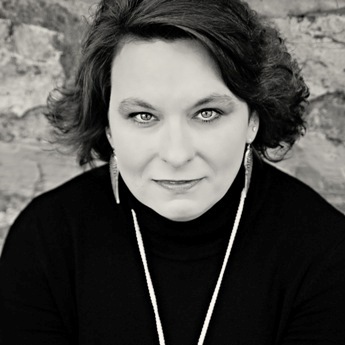 Sara Walter Ellwood is a multi-published and international Amazon bestselling author of the anthology set Cowboy Up. She also publishes paranormal romantic suspense under the pen name Cera duBois.